NEWTON, Iowa – It was Josef Newgarden’s world and the rest of the Verizon IndyCar Series field was just living in it on Sunday afternoon at Iowa Speedway. Newgarden led a race-high 282 laps in the No. 21 Fuzzy’s Ultra Premium Vodka Chevrolet and beat second-place Will Power to the checkered flag by 4.2828 seconds. Newgarden’s 282 laps led in the Iowa Corn 300 set a new Verizon IndyCar Series record, breaking the previous record for most laps led set by Ryan Hunter-Reay at the Milwaukee Mile (250 laps led). 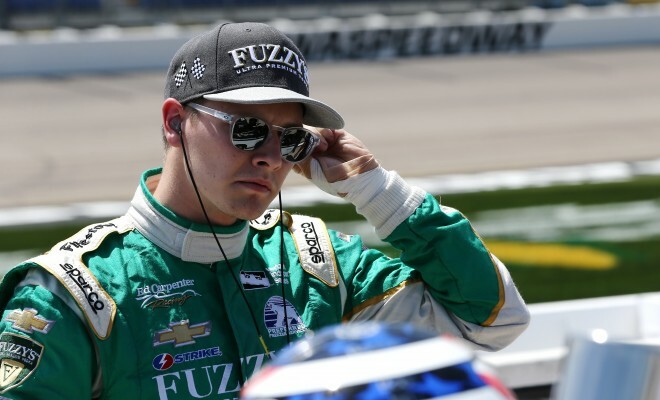 Newgarden became the seventh different winner in 10 races this season and earned the seventh Indy car win for Ed Carpenter Racing. “Man, it’s hard to not get emotional after these things. What a great car. I have a great team with Ed Carpenter Racing and a great team owner in Ed Carpenter. It is great, man. Best car I’ve ever had. This is so cool,” Newgarden said in victory lane at Iowa. The victory was the third of Newgarden’s career and his first on an oval. 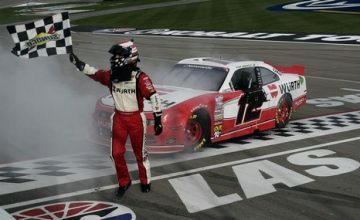 The win comes less than one month after the 25-year-old Hendersonville, Tenn. native was involved in a horrific accident at Texas Motor Speedway in the Firestone 600. The accident left Newgarden with a broken right clavicle and a fractured right hand, but didn’t prevent him from competing in the next race at Road America, where he finished eighth on the 4.048- mile historic road course. “I forgot about that,” Newgarden said of racing with his injuries. “We’ve been so close to winning on an oval with this team. I hate having a cop-out and I don’t want people to think I’m having a harder time because of the injuries. This place is already difficult; it is one of the most difficult places we go. As for Power, he didn’t have anything for Newgarden and considered his victory all the more impressive given his injuries and the physical demands of the 7/8-mile track dubbed “The Fastest Short Track on the Planet. “It took us all day to get to the front basically, Power said of his second-place finish in the No. 12 Verizon Team Penske Chevrolet after starting in the eighth position. “We needed long stints to get back to the front because our car was good on the long runs. I don’t think we had anything for Newgarden, he was on another planet. Scott Dixon, Simon Pagenaud, Mikhail Aleshin, Alexander Rossi, Sebastien Bourdais, James Hinchcliffe and Charlie Kimball completed the top-10. Newgarden got around pole sitter Simon Pagenaud on the first lap and led until Lap 50 when he hit pit road for four tires and fuel. Once the green flag stops cycled through, Newgarden had a whopping 12 second lead over the field and just five cars remained on the lead lap. At Lap 95, Newgarden led second-place Pagenaud by 14.4533 seconds. Mercy for the field finally came in the form of Ryan Hunter-Reay. The engine expired on Hunter-Reay’s No. 28 DHL Honda at Lap 109 to bring out the first yellow flag of the race. The field pitted and several cars took the wave around to have 11 cars on the lead lap when the field returned to green at Lap 128. Hunter-Reay was the defending race-winner of the Iowa Corn 300 and had won three of the last four races at the track in Newton, Iowa prior to this weekend. The Andretti Autosport team, for which Hunter-Reay competes, had won seven of the previous nine races at the track, including the last six before Newgarden snapped the streak on Sunday. It was a difficult weekend all around for the four Andretti drivers as their cars struggled in practice and qualifying. With the exception of the sixth-place result by Rossi, Carols Munoz finished 12th, Marco Andretti finished 14th and Hunter-Reay was last in the 22nd position. 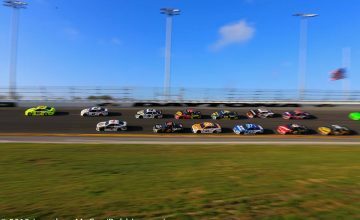 The 300-lap race featured 10 lead changes and was slowed by three caution flags for a total of 42 laps. The strong performance by Newgarden vaulted him to the second position in the championship standings, trailing leader Pagenaud by 73 points. Power (-75), Dixon (-88) and Helio Castroneves (-91) complete the top-five in the championship standings after the 10th race of the 2016 season. The Verizon IndyCar Series heads north to Canada next weekend for the Honda Indy Toronto on the Streets of Toronto’s Exhibition Place on July 17.